Plus 59 othersFrom around the world! OMG! These look phenomenal. Great Post. Thanks! Sounds absolutely wonderful - will be making these soon! FINALLY made these last night - They were FANTASTIC! Hubby loved them too! (always a plus) I did make them hot though for our tastes. Used 'hot' enchilada sauce, 'hot' green chiles, and HOT El Pato tomato sauce. I only had 1 lb. of hamburger but used the same amount of sauce, and probably a third less of the corn bread. SOOO Good, I also made them a little larger obviously cuz it made only 27 balls - served them with the sauce over rice. Definitely will be making again! Thanks Rosemary. High 5! Been hearing good things about this one! Gonna try soon. Now I know why you put 'Oh Yeah' in the title!!! Oh Yeah...these are so GOOD!!!! 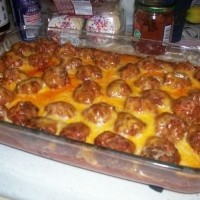 I made them exactly as written except I did what Wynne did...I stuffed the cheese inside each meatball instead of putting it on top! It worked out great, as you can see from my photo! These are very much like a chili meatball! I can't wait to make these for a party! These are a 'must try' everyone!!! Looks really good and unique...am bookmarking this one! This looks so good!I'm saving this one! Mrtnzangel showed this in the "I Made It" group...and I'm so glad I saw it! What a great idea im saving this one cant wqit to make it! I must be living in the wrong state if dishes like this exist! Thanks for the recipe! I am so happy to find it here and will be making it for the holidays! These sound really good, thanks for the post, don't know how I missed this one. Hope your having a great Memorial Day Weekend, you got my 5 on your meatball recipe. Oh yeah is right. Love it. thanks.